Even as the GOP presidential primary season gets well under way, the White House continues to insist President Obama has yet to focus on his own reelection bid. It may come as no surprise then that when Obama made an unannounced visit to his campaign headquarters in Chicago Wednesday night, members of the traveling press corps were kept far away. To be sure, images of Obama giving high fives and back slaps to his campaign staff would surely contradict the notion that the president has yet to give any significant thought to the effort ahead. Earnest wouldn’t provide a specific reason why the press was not allowed to cover the visit. Later he put out a short statement describing the event. After the visit to the headquarters, Obama will attend three fundraisers for his reelection campaign and the Democratic Party. Television cameras are allowed into one of those. Everybody knows the best way to win an election is with the VOTE!!! See how it happened in New Hampshire! CNN never says Barack's first name, or Barack Houssain's middle name! Sometimes they don't even call him President... just by LAST NAME! Ok,,, so Obama or is that [Obama] is (insert activity) against/with Nancy Pelosi, Maxine Waters, Barney Frank, Call me Madam Senator Boxer, soon to retire – 8 DEMOCRAT/Independent SENATORS, etc. 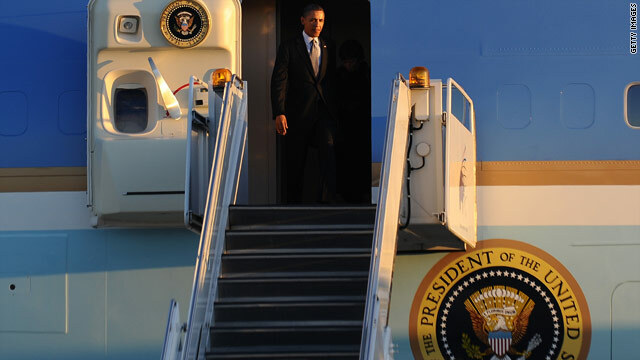 as [BARACK Houssain] made his way to Air Force One to meet with his Wife and Mother-in-Law, ALREADY on Vacation. With all the garbage the Reps. are spewing I don't see why he shouldn't be looking toward his reelection. He's proven he is a multi-tasker. He's certainly outdone the do nothing congress on accomplishments! That is not the point. The point is his administration is putting out false info. We are all (almost all) are grown up enough to understand it is campaign season. Why are they lying about it? He has already attended fund raisers. No big deal! just stop lying about it! He is a bum. He has done nothing with the approval of Congress. Doing by executive order is Socialism. THIS, WE THE TRUE PATRIOTS OF AMERICA WILL STAND FOR IT NO LONGER. OBAMA IS GONE. TO QUOTE HIS NOT CAMPANIGING IS A LIE. HE HAS BEEN CAMPAIGNING SINCE DAY ONE OF HIS FIRST TERM. USELESS, USELESS, USELESS, THE WORST PRESIDENT THIS COUNTRY COULD HAVE EVER IMAGINED. I FOR ONE WILL NEVER VOTE FOR A HOE HANDLE LEANER. @Field1stSgt: If you are going to attack the President, at least make sure you understand the meaning of the words you use. "Doing by executive order" is not "socialism" as you claim; it's the exact opposite of socialism, called "fascism." You have simply proven yourself an uneducated fool who spits back soundbites that you've heard even if you don't understand what they mean. Besides, your later comments about the President's wife show what you really are: a racist, hateful person. You have no clue what you are talking about and your english needs a lot of work as well, so i am also guessing you are not so educated. This country is headed in the correct direction, it would be much faster if the Congress worked. I think you are confusing the President with Congress. Congress is the nations current problem, once the Tea Party is out, things should start to move faster in the right direction. please do not even respond to this, atleast until you know what you are talking about. Romney or any other Republican take office we see the Bush/Cheney days all over again, is that what you are really looking for? @john (sometimes used to describe a bathroom, a potty, etc. I tried to find the definition of "english" in the Dictionary. No such word! Closest word was "English" with a capital "E". Your first sentence is a run on sentence, so I, too, think you might not be so educated, and probably went to Public School, and you do not have a clue, and the country is indeed going in the WRONG DIRECTION. You need an apostrophe on the Word "nations". Etc, Etc, Etc! John, if you want to discover why you, and all the other Liberals/Progressives are Brain-Washed, read the information at the following web site! Please stop spending taxpayers dollars on your re-election. Why would you even say that? Where is the evidence that he uses tax money to campaign? YOU'RE FOOLISH IF YOU THINK NOT. ASK YOURSELF WHERE HIS BIG REARED WIFE GOT THE MONEY FOR HER AFRICAN TRIP SHE IS ON TAKING WITH HER, HER TWO CHILDREN AS SENIOR STAFF MEMBERS WITH PAY AND HER STAFF FOR WHAT I MIGHT ASK. USE OF U.S. AF PLANES COST, $698,0000 DOLLARS, FOOD FOR MEAL GOING OVER $968.00. PAID FOR BY TAX PAYERS?CALLING THIS TRIP NECESSARY. HUH? YOU PEOPLE ARE EAT UP WITH THE DUMB IF YOU THINK THIS MAN HAS ALL OF AMERICA'S INTEREST AT HEART. HE IS NOTHING BUT A SOCIALIST, ISLAMIST MUSLIM. He does not use public funds for campaigning, it would limit the amount of cash he would get. He also does not take PAC funds....he uses bundlers...that show you raise a billion dollars, and how you sell the presidency to the highest bidder... remember hope and change? He (obuthead) hopes none of you lefty suckers don't change your vote. He uses donation for his reelection. Just like the right wing.! Republicans Think that people forgot who's mess Obama was elected to clean up. Two wars and a Job loss and Foreclosures 401k loss and Bin Laden. In 3.5 years He has done alot in these years than Bain Capital Vulture capitalist could do. Get ready for the General Election. Iraq war ended. (I would be shocked to see Ron Paul supporters voting for Pro war Romney) now that Ron paul is not getting the Nomination. We cant wait...Nov 2012 Obama Getting America back from the brink and to Prosperity. If you are 55 and older and vote Republican you may want to kiss parts of your Social Security safety net goodbye. With the Economy growing the Stimulus did work. God is good. DON'T BE A NUT. COME UP WITH SOMETHING ORIGINAL. IF A MAN HAD THAT MUCH BAGGAGE TO CONTINUE WITH WHY WOULD HE IMMEDIATELY LOAD $4 TRILLION DOLLARS TO THE NATIONAL DEBT IMMEDIATELY WITH IN 6 MONTHS OF TAKING OFFICE. EVERY DIME HE GAVE AWAY WENT FOR NAUGHT. HE IS A BUM AN OPPORTUNIST WHO INTENDS TO MAKE HIMSELF AND HIS BOSS GEORGE SOROS RICHER. HE FULLY INTENDS TO DESTROY THE CONSTITUTION AND MAKE OUR GOVERNMENT A MARXIST/SOCIALIST GOVERNMENT. THIS WILL NOT FLY. WHICH HE WILL LEARN THE HARD WAY. BUT IF YOU'VE EVER TRIED TO TALK SENSE TO A COCONUT HEAD THEN FORGET IT. IF YOU THINK I AM A CONSERVATIVE AGAIN FORGET IT. I WAS A 50 YEAR DEMOCRAT UNTIL THIS PILE OF NOTHING TOOK OFFICE. NEVER AGAIN WILL I VOTE FOR A LEANER ON A HOE HANDLE. THE DO NOTHING BUT WANT EVERYTHING GIVEN TO THEM PEOPLE. THIS OLD STORY OF BLAME IT ON BUSH AND CHENEY WILL NOT FLY ANYMORE. HECK FIRE THEY DIDN'T INHERIT NO PILE OF ROSES EITHER. CLINTON HAD EVERY CHANCE TO STOP THE TERRORIST, BUT PASSED. THEN GEORGE WAS FACE WITH THE PROBLEM. WHICH THANK GOD HE HANDLED PERFECTLY. IT WAS HIS AND CHENEYS PROGRAM THAT EVENTUALLY LED TO BIN LADEN'S DEATH NOT OBAMA'S THE LOSER WHO DENIED THE SEALS THE OPPORTUNITY OF GOING THREE TIMES UNTIL PANETTA TOOK IT ON HIMSELF TO ISSUE THE ORDER. BELIEVE IT OR NOT, IT IS THE TRUTH. You make some seriously good points. Thank you for being another voice of reason in th wilderness. Seriously, we need to let President Obama finish trying to lead us in the right direction. First of all before we blame it all on teh republicans, lets look at the Democrats, They had control the last two years of Bushes Presidency, every time Bush or republicans tried to do something good the Democrats block it. Then after Obma became president and the House and Senate being controled by Democorats,.] things got worse. Obama is well known for trampling on the constitution and ignoring it, He wants to set this country up like a Europoean soiclist state. Goverment run health care, forcing people to buy a product they do not want. Under Obama the national Debt has went up and up. Our National debt is more then our GNP. now. We are follwoing the same path as Greece, Obams wants to make peace with the Taliban and other radical groups that ur bent on destryoing this country. Why do you think rouge nations like Iran and Dictators like Chavez are getting fiesty? They know the United States under Obama has lost their will to fight. The housing industry, unemployment have not gotten any better, Companies in record numbers have move over seas to set up. So dont tell me Voice of reason why this is the Republicans fault,, Thnik before you write something , that way you will not look silly. DON'T BE A NUT. COME UP WITH SOMETHING ORIGINAL. IF A MAN HAD THAT MUCH BAGGAGE TO CONTINUE WITH WHY WOULD HE IMMEDIATELY LOAD $4 TRILLION DOLLARS TO THE NATIONAL DEBT IMMEDIATELY WITH IN 6 MONTHS OF TAKING OFFICE. EVERY DIME HE GAVE AWAY WENT FOR NAUGHT. HE IS A BUM AN OPPORTUNIST WHO INTENDS TO MAKE HIMSELF RICHER. HE FULLY INTENDS TO DESTROY THE CONSTITUTION AND MAKE OUR GOVERNMENT A MARXIST/SOCIALIST GOVERNMENT. THIS WILL NOT FLY. WHICH HE WILL LEARN THE HARD WAY. BUT IF YOU'VE EVER TRIED TO TALK SENSE TO A NUT HEAD THEN FORGET IT. IF YOU THINK I AM A CONSERVATIVE AGAIN FORGET IT. I WAS A 50 YEAR DEMOCRAT UNTIL THIS PILE OF NOTHING TOOK OFFICE. NEVER AGAIN WILL I VOTE FOR OBAMA. THE DO NOTHING BUT WANTS EVERYTHING GIVEN TO THE PEOPLE. THIS OLD STORY OF BLAME IT ON BUSH AND CHENEY WILL NOT FLY ANYMORE. HECK FIRE THEY DIDN'T INHERIT NO PILE OF ROSES EITHER. CLINTON HAD EVERY CHANCE TO STOP THE TERRORIST, BUT PASSED. THEN GEORGE WAS FACED WITH THE PROBLEM. WHICH THANK GOD HE HANDLED PERFECTLY. IT WAS HIS AND CHENEYS PROGRAM THAT EVENTUALLY LED TO BIN LADEN'S DEATH NOT OBAMA'S THE LOSER WHO DENIED THE SEALS THE OPPORTUNITY OF GOING THREE TIMES UNTIL PANETTA TOOK IT ON HIMSELF TO ISSUE THE ORDER. BELIEVE IT OR NOT, IT IS THE TRUTH. God bless you, Mr. President. You have done your best to clean the GOP mess. and those of us with a brain appreciate it! OBAMA 2012! Where are all the Obama 2012 Bumper Stickers? No excitement at all (except here,,,, YAWN). Nobody is displaying Obumer 2012 Bumper Stickers! Vote for A.B.O! = Anybody But Obama! And the Seas will no longer rise! Where are the Messiah's Bumper Stickers? On the Cash for Clunkers! Where are the Union-made Cars? What kind of Cars were the Obumber Worshippers Driving? IT is obvious that you are a babe in woods and has not had a taste of NO DRAMA OBAMA! Ask Bush/Mcain/palin while you are still drunk with stupidity you will not know what hit you after the elections! It never ceases to amaze me how ignorance, bigotry and hate always seem to appear from those most in need. They conviently forget facts such as it was the current Prez that plugged the financial hole left by the past admin. Its this Prez that passed the affordable healthcare act that ensured people would not be dropped or could obtain coverage with a pre-existing condition. This Prez leveled the playing field for women's pay, this Prez signed into law consumer protections to prevent credit card and preditory lenders from taking advantage of people. This Prez finished the job the past admin could not or refused to do and that was to bring Osama Bin-Ladin to justice. So all you so-called "Patriots" need to revisit you beleifs about this country. If you have anger it should be directed toward the "Do-nothing" congress who will forfiet your safety and security to make a buck. Elect Romney and we will all suffer the consequences of a Gordon-Gecko corporate raider economy where retirement pensions, social security will be gambled away in the stock market. Sounds to me likre you are a soicalist, and wants the goverment to do everything for you. Not me, I do not want a goverment that forces people to buy something they do not want like Health insurance. That should be a person choice. As far as this Consumer Protection agency Obama decided to stomp the constitution and apoint a leader. Obama sure likes to be sneaky. Now watch Companies leave this country in record numbers to avoid all these so call stupid regulations the goverment wants to start. Which will cause more unemployment. Wake upi Tew astop seeing the world thru rose color glasses. The administration stated he is not focused on his re-election bid. That is not true, which means its a lie! I understand the issue with fund raisers, as it cost big money to get elected/re-elected. Either they should have been be truthful or said nothing at all! that is my point! How is the GOP flaunting the money? How is he raising money with more class? Just curious! scott wants the right to not buy health insurance but if he gets sick I guess the rest of us will have to pick up the tab. Isnt that whats happening now. So call it what you want but we are required to have car insurance and sociAL security. Kids wear safety helmets . Some states require helmets for motorylcles. We have care seats for kids. We have laws about smoking and drinking and what we wear or do not wear in public. So get real Health care is good for everyone and I don't want ot pick up the tab for yours. So if this helps dead beats like you great. Now you have to buy your own . FOr your info being retired Military I allready have healthcare and Dental thru my job.. However my son does not, He wants to know why he would be forced to buy a policy that he would have a hard time affording. Also car insurnace is not a requirement, if you do not drive you do not have to pay it. As far as Social Security goes I doubt by the time I retire I will have anything to draw from. That is why I have a 401K set up to help my retirement when their is no more S.S. THe way the Obama adminstration is going thru it, I will be lucky to have anything. Safety Helments, etc??? they are not requried. Wake up George and smell the roses or go back to the jungle. ...so Scott, if your analogy is "car insurance isn't a requirement, if you don't drive; applies the health insurance debate HOW actually?" Do you know of someone that will never need health insurance? Don't know how a person who actually cares about their son would fight for him NOT to have insurance. I apologize but that doesn't make sense to rational person. You must mean something else entirely...right? oh by the way Scott, your wrong headed ideas about Social Security is so far off, I really don't know how you could possibly discuss the issue. Many of the top economist have concluded SS is solvent thru at least 2025, possibly 2030. And you keep saying that "...SS won't be there the way Obama is going thru it".....A couple of things here: 1) Do you not recall GWB's idea of privatizing SS just before HE crashed the stock market???? 2) Remember the Medicare part A and the fact that we never funded it and that program, like the two unfunded wars have devasted the U.S economy and GREATLY impact not only the solvency of SS but potentially the entire economy...save the for the President Obama kept us from going into a 2nd depression. That's way it seems that you haven't really considered the facts here. I am trying be respectful, not calling you names, but most intelligent people wouldn't be fighting for the right to NOT BUY insurance, and most americans know that President Obama's policies have been good for americans in general as opposed to the mess he inherited. "No. 7 Chile has surpassed America, confirming the wisdom of its reforms, including its social security system's wildly popular and highly successful personal-account option. These were inspired by the ideas and disciples of the late, great economist and Nobel laureate Milton Friedman." Problem with the article is the USA has slipped to #10 from #8 with regards to Economic Freedom, in the last 2 years, and soon to go to #11 or higher this year. When I originally commented I seem to have clicked the -Notify me when new comments are added- checkbox and now every time a comment is added I get four emails with the same comment. Is there a means you are able to remove me from that service? Thanks! Your style is really unique in comparison to other folks I've read stuff from. I appreciate you for posting when you've got the opportunity, Guess I'll just bookmark this page. I hope Obama run again for president.